We're making the process of shopping for a house more efficient. Choose any house in Pennsylvania and we’ll show you in minutes how much it will cost to buy it, your monthly mortgage payment and where you can save! Estimating Your Closing Costs Has Never Been Easier! In less than 5 minutes, you'll know if that house is within reach. Answering all the simple questions as accurately as possible will give you a more accurate final estimate of the final amount you need to bring to the table at closing. 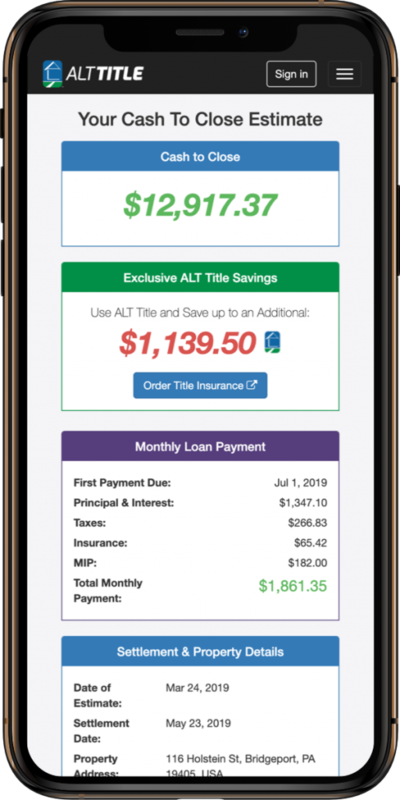 Get a clear breakdown of when payments start and how much they'll be, including principal and interest, real estate tax, school tax, and insurances. Before making an offer on a house, you'll have a clear, comprehensive list of all your closing costs including lender fees, title fees, recording fees and transfer tax. We highlight where you can save money on your title or real estate services. Look for the ALT icon throughout your final cost worksheet to see where - and how much - you can save. Enter any address in Pennsylvania – even if it’s not currently on the market. We’ll calculate the funds you'll need at settlement, monthly mortgage payment and provide a detailed cost worksheet. The CashtoClose Support Team is available at every step, just click the Live Chat link. Our app is built to work on mobile devices, desktop, and tablets. Use any web browser. Enter an address and answer the questions. when in doubt, use our tips and suggestions. We'll search public data and crunch the numbers. We'll even search for some savings! Through the CashtoClose dashboard, you can revisit, edit, print and share your Closing Cost Worksheets. Create as many estimates - for as many properties - as you like. This is YOUR tool to simplify your home search and selection process. We've designed the calculator to work across the state of Pennsylvania. The app will automatically lookup county, municipal, and school district taxes to find the tax assessment needed to calculate your estimated yearly taxes. We believe CashtoClose is the perfect complement to your home search process. No matter where you like to browse for houses, you’ll want to have the CashtoClose app open! 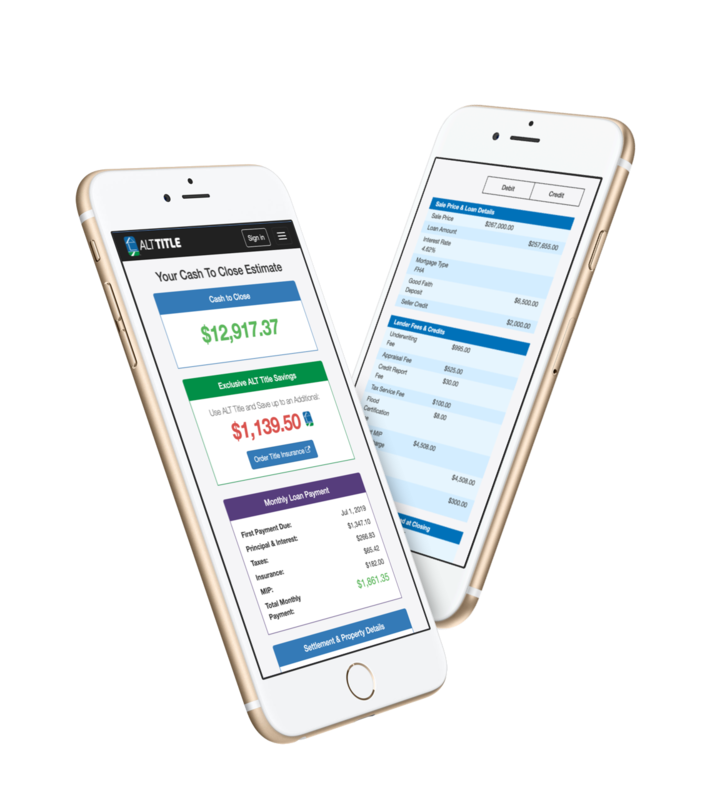 "I’m a mortgage loan officer and Frank told me about this app. I was looking for something for my clients to use to help them get more details about any house they wanted to purchase. My clients were impressed with the tool and how easy it was to use. I’m recommending this tool to all my clients now. Helps them to know what to expect when they’re ready to buy their next home." "I called my agent when I thought I found the perfect rental property to add to my portfolio. My agent referred me to the CashToClose app. I can’t believe how easy it is to find out how much I need at settlement. This app is the best!" "In today’s real estate market home buyers have so many tools online to find the house they want. As an agent I’m always looking for resources to help my clients through the home buying process. Before I heard about this app I used to manually try to figure out how much money my client needed to bring to the table at closing. Now I just use this app and step through the questions and voila! I can give my client an accurate estimate in minutes. I use this app for all my clients now!" If you're interested in adding a co-branded version of CashtoClose to your real estate or mortgage website, please contact us for details. © 2019 ALT-Edge Technologies, LLC. All rights reserved.